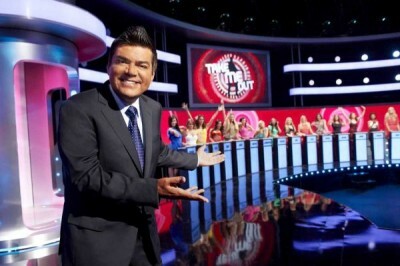 Comic George Lopez is the host of a provocative and unpredictable dating TV series. Based on a very successful international program, this show features 30 single women as they search for a match and several brave bachelors who must make the ultimate first impression. The program is filmed in front of a studio audience and is comprised of four rounds. It begins with a group of 30 beautiful ladies and every week, the women are introduced to several bachelors one by one. Each woman stands at a lighted podium with a switch that controls her fate for a date. If she thinks it’s a match, she keeps her light on; if her attraction has been short-circuited, it’s lights out and she’ll wait for the next potential Mr. Right. As the hopeful mate reveals more and more about himself, the women continue to turn their lights out as they lose interest, leaving only the flirty females still fascinated by him. First aired: July 26, 2012. Please, bring Take Me Out back for a second season this year. Since Fox is planning to revive The X Factor for a fourth season. I am searching for another episode of Take me out. I miss it and my boyfriend “a reader and sports fanatic” says it was a pretty interesting show. I hope it doesnt get cancelled. One of Georges finest.